What to look for in gifts for dog owners? Best Christmas gift for dog owners? 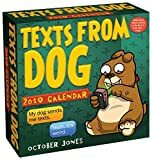 Best birthday presents for dog owners? Knowing what to get for a friend or a family member when shopping for gifts can feel tricky, or near impossible, but there is a trick to help choose the right thing. What does the person in question like? If the receiver has dogs, then we have some good news for you; since most dog owners are easy to buy presents for. Dog owners, in general, love to spend time with their dogs, and when they are not with them – they love to talk about those furry little friends of theirs. Give a loving dog owner something dog related, and you’ll see their faces light up as they envision all the great times they will have with their four-legged snuggle pals. A tip to nail that perfect present for a dog owner is to get them something that they, too, benefit from, and not something that is strictly for the dog. It is every dog owner’s dream to be able to see what their beloved fur pup is up to when they are home alone, and even better – communicate with them! This clever device lets you watch a wide-angled live-stream of your pet through an app on your Smartphone, and it has a sensor that picks up the sound of barking and alerts you with a push notification. Such a feature is ideal when you have a dog with separation anxiety, or if you live in an apartment where the sound level needs to be somewhat controlled. If your dog is barking or doing something that he or she is not supposed to do, you just activate the two-way chat function through the app, and then you can talk directly to your pet and help calm the situation. If you have some extra time on your hands, and if it looks like your doggy could use some distraction, you can even play with him or her! 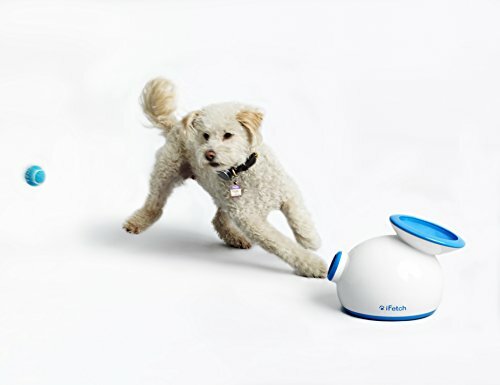 The Furbo can be filled up with treats, and you can release them one by one with the Smartphone app, and have them tossed (yes, tossed) to your four-legged bestie! Catch! Why We Like It – Let’s face it – we all miss our dogs when we are not home, and this incredible invention lets us be with them, even when we are physically apart. Any dog owner would love a thoughtful gift such as this, and it is also convenient since it can help with a dog’s separation anxiety. 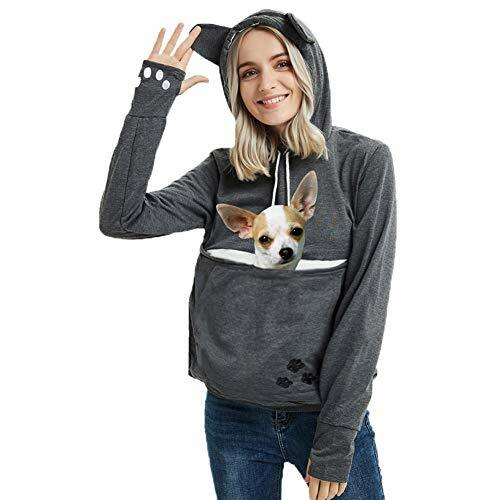 If you are on the hunt for a present for someone with a small dog they can’t seem to separate from, then perhaps this cozy sweatshirt could be a good gift option? It is made with 65% polyester and 35% cotton, and it has a large pouch on the front, which allows the person wearing it to carry around a small dog or a cat. What better way to make life easier for someone who spends a lot of time carrying their fur friend (perhaps because they like being carried, or because they’ve developed the bad habit of not wanting to go any further on walks). The pouch is soft, comfortable and big enough for small pets to enjoy the ride, and the liner inside can be removed for easy and thorough washing. Give a friend or a family member the opportunity to try out the ultimate snuggle sweater and make both an owner and a cuddle loving dog happy. Why We Like It – This product might bring out a few laughs, but the truth is, many small pets enjoy being carried, and they might even request it. A sweater like this makes the perfect gift for someone who can’t say no to those puppy eyes since it allows them to carry him or her around while still having two free hands to use to carry out other pending chores. Alternatively, a dog sling can do the trick! Do a dog owner a favor by giving away something that will make their dog walks easier and more fun! 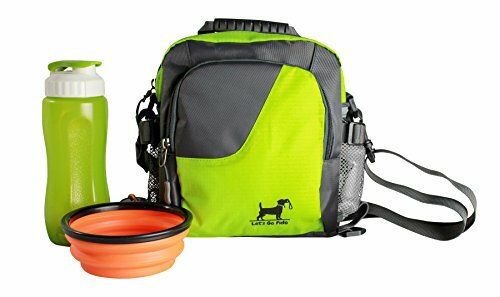 This versatile walking bag is the ultimate accessory, for walks, shorter hikes, a trip to the dog parks or for running with your pup, since it can be worn in many ways. It comes with two straps, meaning it can be turned into a backpack or be worn cross-body, or you can strap it on like a fanny pack – carrying it effortlessly around your waist. As if the versatility wasn’t enough to make this a great gift, there is also a 16oz water bottle with a wrist-strap included, plus a collapsible dog bowl with a sturdy carabiner. For a sporty dog owner – figuring out where to put your keys, cellphone, doggy waste bags and treats can be a real struggle, and this lightweight nylon bag is both a practical and a stylish solution. Why We Like It – With a product like this, you can variate how you wear it depending on your planned activity with your dog, and how much weight you are carrying. This is the perfect bag to have when living an active and happy life with a four-legged friend. Extra plus for the included additional items. A gift like the interactive iFetch Ball thrower might seem like it is more for the dog than for the dog’s owner, but think about how great it will be for a tired dog owner to come home from work, and for their happy and excited dog to be able to play by himself in the backyard, while his human mama or papa enjoys a well-deserved glass of wine in the shade! The settings let you choose if you want the device to launch the ball 10, 20 or 30 feet so that you can adjust it to space you have in your yard or wherever your dog is playing. A dog won’t automatically know how to reload the launcher, but it is a fairly easy trick to teach! Dogs are intelligent animals, and if you work with them and encourage them to bring back the ball and drop it back into the launcher – it won’t take long for them to figure out that doing so launches the ball for them to run again. If you are unsure of how to teach this, you can find plenty of training videos available online. Make sure you choose the small size for small dogs and a large ball launcher for big dogs. Why We Like It – It is hard to say no to a happy dog that just wants to play, but when you get home from a long workday or when the kids are also demanding attention, it can be hard to find the time and energy to play fetch. This automatic launcher makes it possible for the dog to play alone (owner supervision is recommended), once properly trained to return the ball, he or she will love running up and down the backyard at top speed. Like this? You may also like these frisbees for dogs! A dog that gets to go on adventures is a happy dog, and a happy dog makes a dog owners life a lot easier. Not everybody can- or wants to put a furry and muddy dog back in the car after a run-around at the dog park though, so this pet seat cover can be a great present for someone with dogs! Made with heavy-duty Oxford fabric and PP cotton mat; the car seats stay impeccable even after transporting large breed dogs. It has side-flaps to protect the car doors as well, and the hammock design prevents the dog from trying to get to the front seat while the car is in motion. 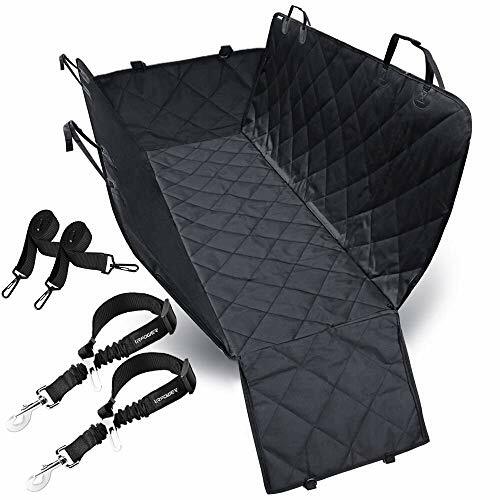 This seat cover hammock stays in place with seat anchors, and you can use it with your dog’s regular seat belt and harness, thanks to the small Velcro openings in the fabric. 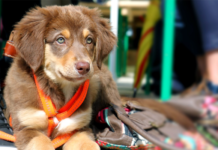 Give someone the gift of being able to take their pup with them for outdoor adventures! Burying your face in your pup’s fur is among the most relaxing things you can do, but while we love the feeling of all that hair against our cheeks – most of us dog owners would prefer that the hair actually stayed on the dog, rather than ending up all over our clothes, furniture, floors and in our food. Who hasn’t opened up a peanut butter jar only to find a dog hair, or take a bite out of a sandwich with a little hairy surprise…? Dog hair has a tendency of appearing everywhere – in the most impossible places – and wouldn’t it be great if there was a solution? This revolutionary brushing tool removes surprising amounts of loose hair; without damaging the coat or skin in the process. Its stainless-steel edge digs down through the top coat and all the way down to the undercoat, which removes that hair that would have otherwise ended up inside your home. Dogs love it, since it feels almost like having your back scratched, and owners love it since it reduces shedding and hair loss. Why We Like It – Give a dog owner a tool to stop the shedding madness! 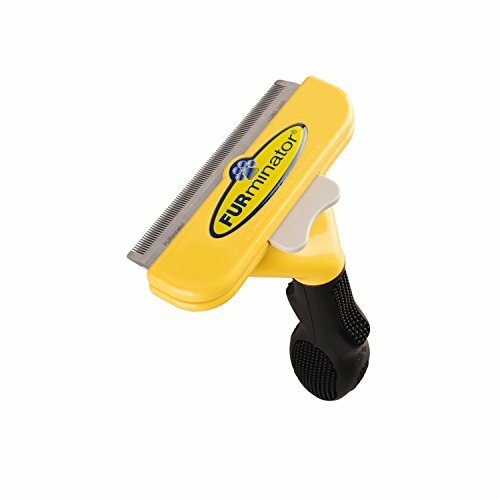 This brush is superior to most others on the market, and their revolutionary design makes it possible to get rid of loose hair without causing discomfort or damage. This is the perfect present for a dog owner with a rescue dog! 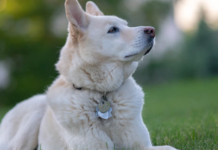 While breed shouldn’t matter in terms of how much you love your dog, it can be relevant to fully understand the dog’s behavior and personality, and to know what they need to thrive. There is also the curiosity aspect, and any mixed breed owner who claims not to be curious about their dog’s genetic background – they might not be completely honest. What better present to give a rescue dog owner than a DNA test to see what breeds contributed to such a perfect genetic mix? A breed DNA ancestry test kit comes with two cotton swabs, which you use to collect saliva from your dog’s mouth. The swab is then inserted into a plastic slip, sealed, and shipped to the lab for analysis. It takes two weeks for you to get an extensive report back, which will reveal the wonderful genetic mysteries of your best fur friend. Why We Like It – A DNA test for a mixed breed dog might not be something everyone buys for themselves, but it is the perfect present to surprise someone with, and once they realize the benefits that come with knowing more about a dog’s genetic background (genetic disease, among other things) – they won’t stop thanking you! An automatic feeder allows you to program one or several of your dog’s meals ahead of time, which are then dispensed at the time of your choice. This is a great device for dog owners with busy schedules, or that might want to feed their dog while they are at work or out running errands. 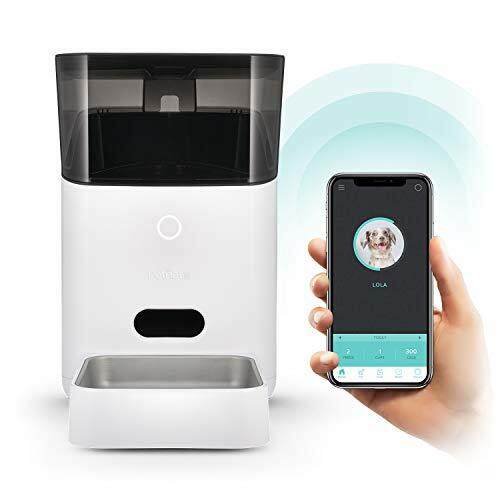 The SmartFeeder is controlled through an app on your Smartphone (compatible with iOS and Android), and you receive push notifications when your pet has been fed and when the feeder is running low on kibble. A great feature is the flexible portions, where you can split a meal into several different portions, to make sure your dog does not gulp down his food too fast. 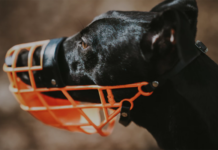 It is a high-quality product that uses modern technology to make life easier for both dogs and owners, and it might be that one thing that a dog owner didn’t know they were in a desperate need for. Why We Like It – Life can get busy sometimes, and not being home to feed your pet can cause additional stress and restlessness. An automatic feeder solves this issue since you can feed your dog with the help of a Smartphone, something every dedicated dog owner could benefit from occasionally. The innovative dog trainer Zak George – known from YouTube and Animal Planet – takes dog training to a new level; away from the idea of needing a pack leader, and towards a philosophy based on mutual respect and teamwork. It reinforces the idea that dog training should be fun; both for the dog and the person training it, and it works to highlight how every dog is different and might need a different approach when being taught new things. 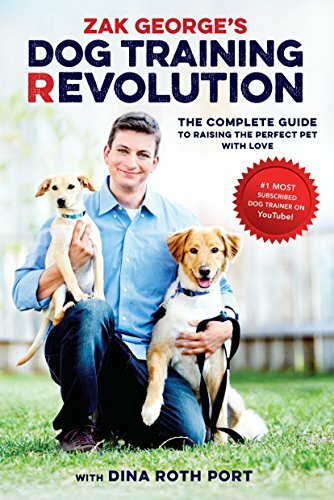 The book has tips for how to choose the right dog, for how to housetrain a new puppy, it takes a look at solutions for behavioral issues; such as biting, aggression, leash pulling, barking, jumping up, chewing and more, and it is a book that aims to help you with dog training, but also to enjoy life with your dog to the fullest! The topics covered in the book pair up with the videos available on Zak George’s YouTube channel, which is perfect for a dog owner that wants to form a strong and healthy bond with their fur friend. Why We Like It – This book is written for anyone who wants to connect with their dog and have fun while learning new things – together. It is a simple gift that the receiver can make great use of and having access to the YouTube videos makes the training experience all the more complete. Knowing what to wear when you train your dog isn’t always easy since you usually need pockets for dog treats, poop bags, a poop scooper or whatever else you plan to bring with you for the training session. This training vest from the Finnish brand Hurtta is water-repellent, durable and breathable, thanks to the high-quality Houndex lamination. 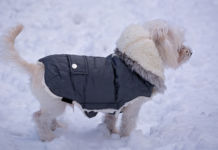 The vest has a comfortable mesh lining, a high collar, and an adjustable waist, and it has a waterproof hood hidden inside the collar, which can be taken out when needed and stashed away when not in use. There are 4 practical pockets on the front of the vest; one with a removable liner for easy washing (perfect for carrying treats). A large pocket stretches across the back – big enough to fit a rewarding toy or even a small ball launcher. It is a cozy vest fit for training and other dog-related outdoor activities, and it has discrete but effective reflectors to increase visibility in the dark. Why We Like It – With a vest like this, you no longer have to bring bulky bags with you when you take your dog to a training class or when you set out to train on your own! 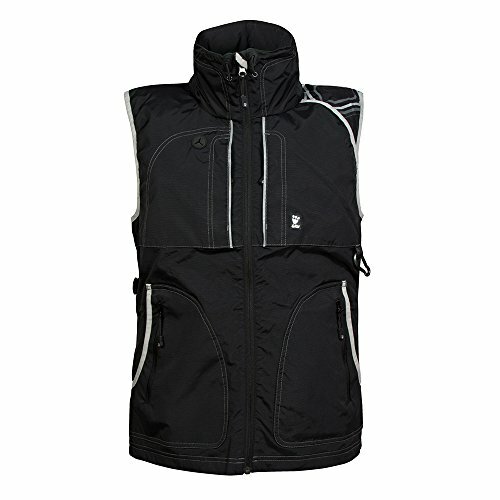 Make life easier for yourself, or for another dog owner, with this stylish and practical training vest. Any owner of a long-haired dog will vouch for how incredibly fast dog hair seems to grow, even though you feel you just went in for an expensive grooming session. An alternative to paying high fees to keep your fur pup looking pretty is to learn to do it yourself! There are plenty of courses to take; both physical courses and online courses, and YouTube is full of how-to videos. It might seem a little scary to cut your dog’s fur, but the truth is – it’s hair, and if it doesn’t turn out the way you had planned it will always grow back. 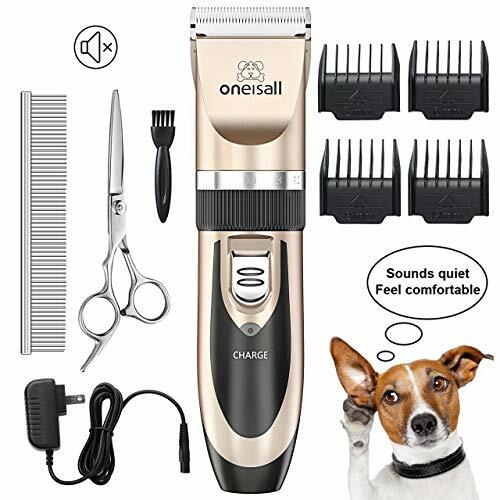 Surprise the owner of a long-haired dog with this dog shaver and encourage them to learn to groom their best furry friend themselves! It saves money and can be quite relaxing once you get the hang of it! Why We Like It – A set of clippers can help a dog owner save lots of money; especially if having more than one dog that needs grooming, and this is a high-quality product that will last for years. 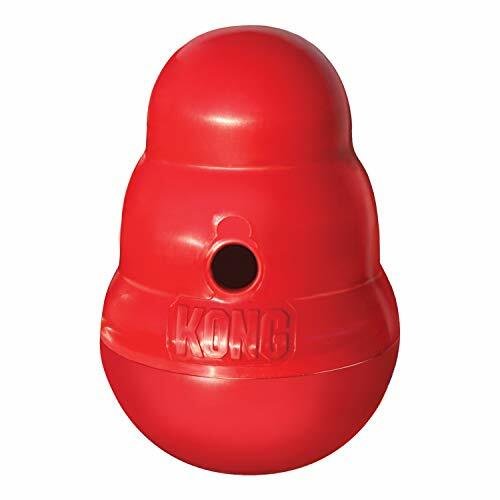 KONG is a brand known for their durable dog toys, and here we have a wobbly treat dispenser that will keep a pet busy for hours (at least in the beginning until they get the hang of it). It can be used for kibble, to slow down a dog with a tendency to eat too fast, or for delicious treats! Why not mix both? A dog owner is likely to appreciate a gift like this since it will keep their dogs happy and entertained when they themselves might have other things to do. Guilt is a common feeling among dog owners; when feeling like there isn’t enough time to play with the fur besties and a toy can be a true blessing! 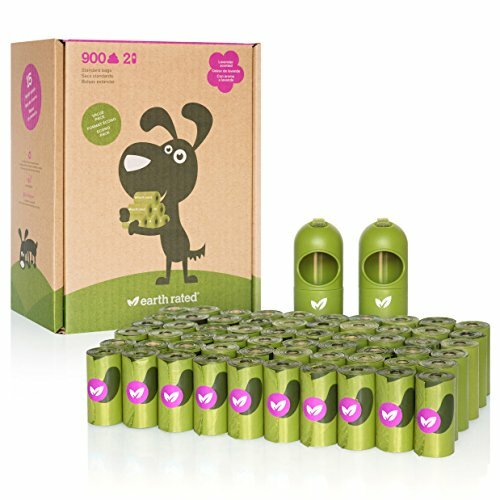 It has a twist-off top for easy refilling, and the design prevents it from tipping over, which means the dog will have to continuously push it to get the treats or kibble out. Why We Like It – A toy that a dog can play with alone is a lifesaver for a dog owner with a busy schedule, and a great- and thoughtful gift to give to someone with one- or several dogs. These leak-proof waste bags for dogs are biodegradable, easy to open and lavender scented (you can also choose a neutral scent if preferred). There are 15 bags per roll, and this large pack contains a total of 60 rolls and 900 waste bags. It’s a supply that will last, and while it might seem like a strange thing to give to someone as a gift – we can assure you that a dog owner will appreciate it. Running out of waste bags just as you are about to head out for a walk is frustrating, and even though a pack of poop bags isn’t too expensive, the costs quickly build up when you have dogs. Take one concern off a dog owner’s mind by giving away this maxi pack of waste bags and take a stand for mother earth! Eco-friendly and biodegradable bags may not save the environment, but it is a small step in the right direction. Why We Like It – Sometimes it is the small things that mean the most, and to give away something that all dog owners need constantly – doggy waste bags – you show that you care, that you have thought of their needs and that you’ve come up with a present that they will actually use. It isn’t always possible to give a dog total freedom; because not everyone has access to a dog park, and not all dogs do well off leash. Some might be prone to running away, or there might be too much traffic close by. A good solution for dog owners that can’t (for whatever reasons) let their dogs run off leash, getting an extendable leash can be an alternative! This extendible dog leash is 26ft long, which is a lot longer than many other products, and it gives your dog a chance to run and play while still attached to something. You stop the leash from further extension by pushing the large button on the handle, and there is a lock function if you would like to stop it at a certain length. 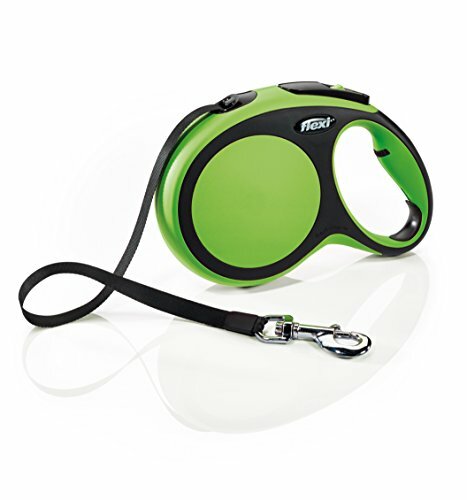 A leash like this makes it possible to provide a dog with freedom without giving up control, and to get to run and play in a safe environment. Why We Like It – Seeing your dog happy is something every dog owner wants, so why not give someone a gift that can be used to make their dog happy, without compromising their safety? Very sturdy handle with a comfortable grip, and great for large dogs. 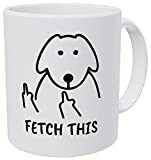 Still not sure what to get for that dog-owning friend or family member? How about some peace of mind? A dog gate is always useful, regardless of whether your dogs are allowed in the whole house or limited to a smaller area. 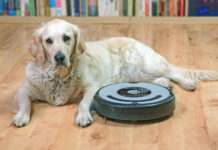 You can use it when cleaning, to stop those four-legged pals from stepping on mopped floors, or when that guest who is terrified of dogs comes over for a visit. A doggy door can help with training, make house training easier, it can simplify things when leaving the dog home alone and work as a separator for dogs that don’t always get along. When getting a gift form someone with a dog, you want to make sure they can use it, and if it is in anyway dog related – chances are they’ll love it! The steel frame of this pet gate is sturdy and secure, it has a door for small pets (small dogs and cats) that can be left open or closed, and it uses four pressure mounts to securely attach it and keep it in place. 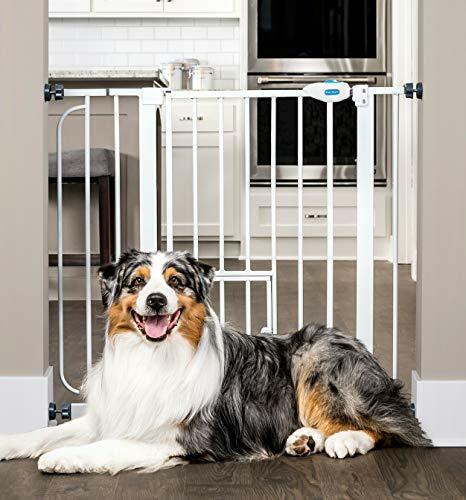 Why We Like It – This stylish and minimalistic doggy gate looks great, fills its function and can easily be moved from one door opening and to another. No hassle, and a great help around the house when trying to clean or restrict the dogs to a certain room or area. Make someone smile by giving away a set of matching bracelet and nice dog collar, so that they can walk around with something around their wrist that constantly reminds them of their best furry friend – even when at work or temporarily away. These cute sets come in many different designs and color varieties, and there are different sizes made to fit all dog breeds and all neck sizes. The product is 100% cruelty-free and it helps rescue animals by donating a percentage of the profits to shelters across the United States. 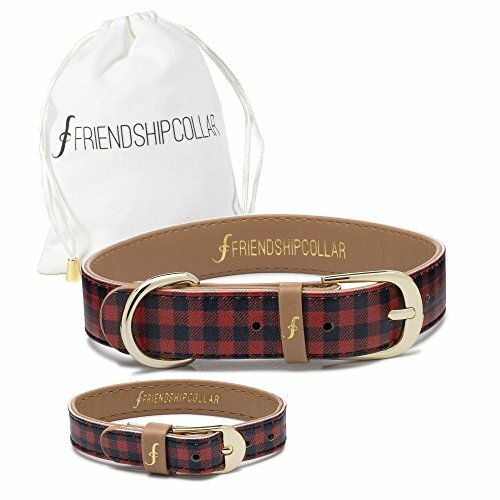 Why We Like It – It is simple, affordable and adorable, and something that will make a unique and thoughtful present to anyone who loves their dog. Just like a surfer would love to get something surfing related as a gift, or how a flower enthusiast might be thrilled to receive an exotic plant – dog owners love everything dog related. Pick a gift that has something to do with dogs, but make sure that it is also something that they will benefit from directly and not just the dog. It could be an item that somehow makes their lives easier; such as an activation toy to keep a dog entertained, or why not a device that allows the passionate dog lover to monitor their pup when they are away from home? The options are many, so choose wisely, and show your friends and family members who are pet parents just how much you care about them. Look for an item that – while having something to do with dogs – is not only useful for the dog, but for his or her owner too. Buying bully sticks is thoughtful and all, but might be more suitable for the dog’s birthday, rather than for the birthday of the dog’s owner. Think about what they could use in their everyday lives with their dogs, and how an item might help them in some way; either on walks, during training or inside the home. 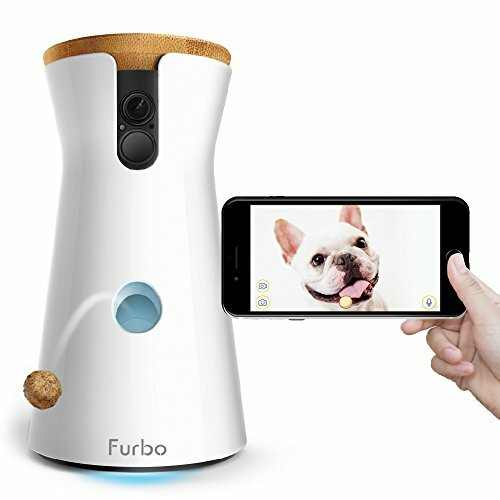 Consider the ‘Furbo Dog Camera’, which is a device that allows you to monitor your pet through a camera! You get notifications on your Smartphone if your dog is barking while you are away, and you can activate a chat function that lets you talk directly to the dog! The device can even toss treats with a simple click on your phone, and it is a great way to light up dark winter days, both for owners and for dogs. 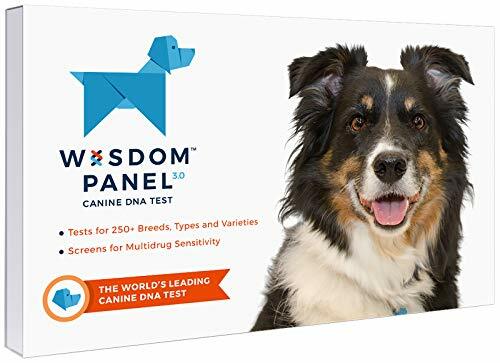 Surprise the owner of a mixed breed with a ‘Wisdom Panel DNA Test’! 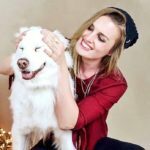 This revolutionary product lets you collect saliva from your dog, send it off to a lab and have it tested for over 350 dog breeds. You then get an extensive report in the mail a couple of weeks later, with information regarding the dog’s genetic makeup. If you are buying a gift for a dog owner – don’t worry! 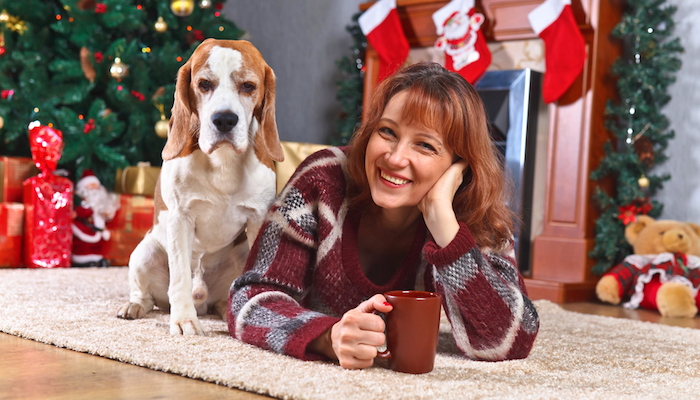 There are plenty of options out there for the perfect gift for a person with a dog; something they will love and be able to enjoy together with their dog(s), in one way or the other. Try to put yourself in their shoes – if you had a dog, what would you want/need the absolute most? Have fun with it too, because if the person you are shopping for is anything like their dog – they’ll be beyond grateful! Choose with the heart, and don’t worry too much about getting it right or wrong. Dog owners will appreciate the effort to give them something personalized, something they will love, and as they might even be a little touched that you have taken their passion for dogs into consideration. There are about 400 million dogs in the world, so just imagine how many dog owners there are out there! A Mug To Keep is a registered trademark of Fred And Levine.